I am very happy with wonderful response that the Haat e Bajar e series got. My Dad is sure in seventh heaven that his pictures have been much appreciated. Thanks to all of You. Mucho Gracias to the few who took time to dig up pictures and archived posts of more colorful and vibrant local markets from different corners of India. If any of you have any more to share please drop me a line or leave a comment. I am particularly intrigued by the Allepey stores on water that Happy Cook had mentioned. Today will be a round up of the markets from my fellow bloggers and readers. We will start off with a lovely Guest Post and Pictures by Sra of When My Soup Came Alive. The local market she visited in Pune will come alive through her words and pics. A few months ago, I was assigned to visit Pune for a day. It was a field visit, almost literally. Part of my job was to visit the wholesale market there. After a sumptuous meal the previous night, which consisted of endless platters of kababs and ended way past midnight, we were woken up early in the morning and taken to Gul Tekdi market yard. 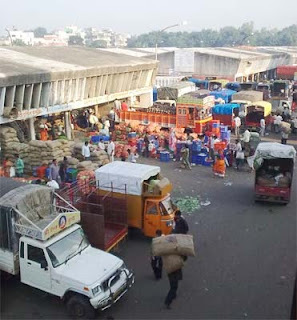 As with most markets, it was bustling with activity even at that early hour of 7 a.m. Lorries full of produce, with brightly coloured tarpaulin on them, had already rolled in and were in various stages of unloading. Our hosts led us through to the office where our meeting was being held, but not before we took some time to look around the place. 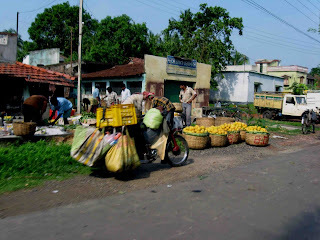 This is a typical Indian vegetable market, and for those who do not know what to expect, can be quite an assault on the senses at this scale. There is much dirt, many tomatoes squashed under the feet of those in a rush, hay, cabbage leaves, cauliflower stalks and other vegetable refuse strewn around. The elements act on all this to produce a pungent and acrid smell that can be quite unbearable. Sometimes, you can smell the rain in the soil that clings to the roots and stalks of produce that just that morning has been wrested from the earth. For good measure, you can see cows feeding off mounds of this green debris, and where cows are, manure shall follow. Of course, the cows (and sheep and other animals) are not peculiar to markets, though. They are everywhere in our country. Many years ago a city bus driver, I seem to recall, sacrificed a few lives, maybe even his own, when he swerved sharply and fell into the river, trying to avoid hitting a member of the bovine breed that ambled onto the bridge, directly in his path. Like this. But I digress. The vegetables are spread in heaps on sacking, and merchants frown on customers picking and choosing good specimens. The wholesale customer from the neigbourhood markets spread across the city, or the buyers for the restaurants and hotels will not bother with that, but if it's you and I shopping there for a good deal, we will have to be content with only the financial advantage. Some sellers use the traditional balance, some use modern electronic weighing machines. Some dispense with the sacking for plastic crates. 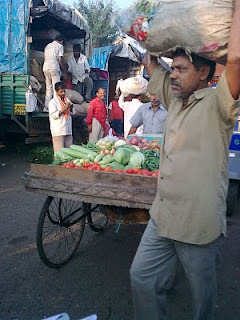 Some vegetables do not get the courtesy of even a gunny bag on which they can be spread, they are piled on the ground, as you can see in this picture. 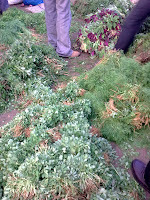 The greens here include fenugreek (foreground), coriander at the far back, amaranth (green and magenta) and dill. See the stacks of huge leaves in this picture . 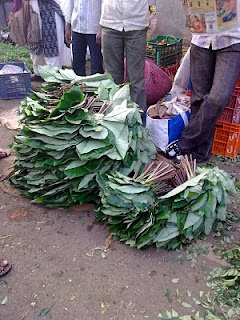 I think they are arbi (taro root/colocaesia) leaves, used to make the wonderful patra (patravade, patrode), a steamed and fried delicacy that consists of besan paste rolled up in these leaves, popular along the Konkan coast right up to Gujarat. I've only ever had it thrice, once inviting a rather serious glance when I asked for a third piece, and most recently, about eight months ago at a friend's place in Queens, bought from an Indian grocery in Jackson Heights, thawed and microwaved and eaten to heart's content. You will also see people hauling loads on their heads, and vendors from around the city coming here with their carts, filling them up with a variety of vegetables which they will sell for a profit in other localities for the next few hours. In any Indian market, there will be much shrill and spirited bargaining. (next few images). 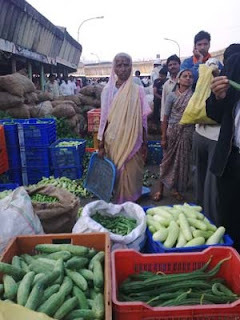 In this particular Pune market, vegetables and fruit come in from a 100 km radius, and the early morning's din evens out to a more measured buzz by noon, when, I remember being told, the market is closed for the day. 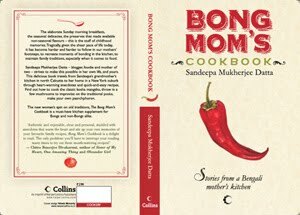 She says "When I was in India last year, I went to see the Mysore vegetable market as it holds many memories of childhood strolls there with my parents and that little bakery where I used to savory snacks and that little bookstore I used to run to buy story books". 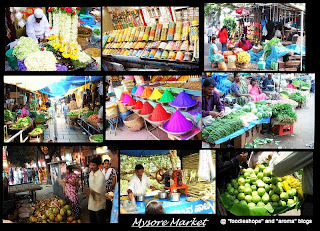 The Mysore Market sure looks clean and colorful, a place that I would have cherished similar memories of. Pictures of her home town local grocery seller from Swagata, a reader who took time to send me these photos by mail. Do you see the bicycle laden with tender coconuts in the second pic ? I love that one. A beautiful Photo Essay of a vegetable market from Kolhapur home of Nupur of One Hot Stove.She says about a smiling old lady posing with a cauliflower, "That beautiful, bright and huge cauliflower certainly deserves to be shown off! Selling vegetables is hard work and a business with a very low profit margin and no retirement plan; this lady is still working when she looks like she deserves to retire and get some rest." 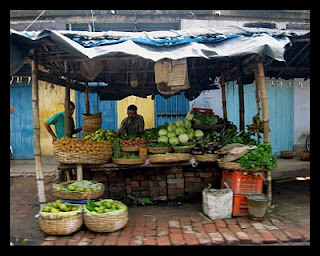 The post has some great pictures, head over to see what it looks like to be in a local market in the west coast of India. Thanks Sandeepa, nice to do a virtual stay too, in your house! :) The link to the accident with the cows didn't get into the post automatically from e-mail, I guess. Liked the rest of the pix too, Asha's are so vivd and vibrant. Were Swagata's pix from Kerala? Beautiful! Great post- made my day, Sandeepa! 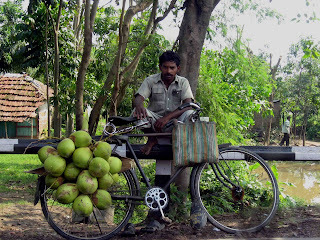 My favorite pic is that of the bicycle with the coconuts, so artistic and unusual. Khub bhalo laglo ei post PoD-e...Kitchen nei ki je kori ei apartment e bos-e!!! Sakal theke Florence jabo na Zurich jabo ei kor-te kor-te bikal bas ...blog PoDchhi..Tomar boudi thakle jhetiye nie jeto kothao..
wow! i just sat back in wonder.. what a beautiful series of posts.. i love the vibrancy of the markets there though hate it in the monsoons! still, are there more posts? what abt ur own palce? Wow! Lovely series and an even lovelier roundup. Trust Sra to bring out the smells, the dirt and the indignity of veggies sitting on bare ground. Loved it Sra. Like everyone else, I loved the bicycle wallah selling coconuts. Now I am off to visit the other blogs to see what they have. Lovely photos, brings back the days of shopping in Indian markets as a kid. Oh memories! Indian markets are so colorful and lively! Loved all the pics. I've got to get out there with my camera next time I visit. Wow I love the fish market, it reminds Pondy (my place)! That is a lovely round-up of market in India, people can have an idea ! Just came back for UNC-CH, went to see Trisha and took her to newly opened Royal Dhaba in Chapel Hill for lunch, great to come back to your post. thanks Sra,Asha,Swagata and Kalyan for posting it here ..and sandeepa well done for a really heart-warming series..
the one with daabwala pic reminded me of my own daabwala back home who would come to deliver daab/green coconut daily in morning.Lovely pics.. Thanks Sandeepa for the wonderful idea...Those who would have missed such markets would have had a gala time in reading and kindling old memories. Thanks to all the contributors too.. Honestly I would die for those fish there... The roundup is so amazing as I told you earlier its painful to miss all the outdoor shopping @ home!!! oneker bhalo legeche dekhe amar-o khub bhalo lagche. The Haat e Bajar e series brought back old memories of my childhood!! Procheshtay porisromer chhap sposhto. Abhinondon. What a wonderful idea, and I missed it! Even had some pics in my folders. I do not like shopping very much, but I love vegetable and fruit markets. Really great post! Thank you everyone! Thanks for this long post, very nice share.